I believe that everyone should do yoga. It is a wonderful stress reliever and helps take away those nagging aches and pains we all have. I am a long distance runner and as all runners know the secret to avoiding and treating running related pain is by stretching. Yoga is the prefect way to stretch out tight muscles and find time to relax and connect with your breathing. There are yoga sequences designed for every little thing that ails you physically or emotionally. You can do yoga anywhere at any time. Indeed, I have even done yoga on a stinky hotel room carpet the night before a half marathon BUT yoga is much more relaxing and desirable when you have a high quality mat to make your practice easier and more comfortable. 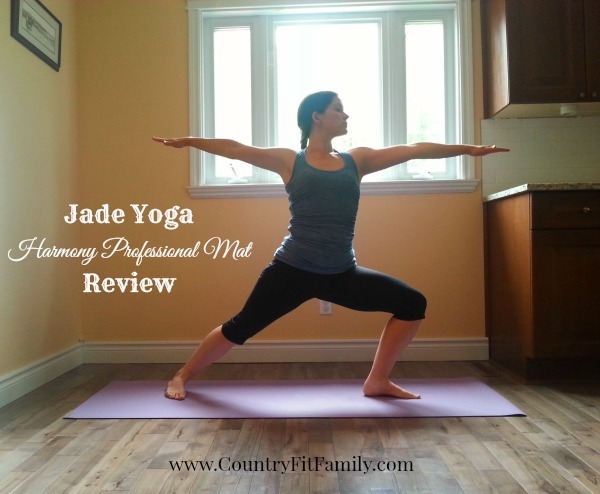 I have been given the opportunity to write a Jade Yoga Harmony Professional Mat review, an environmentally friendly yoga mat. 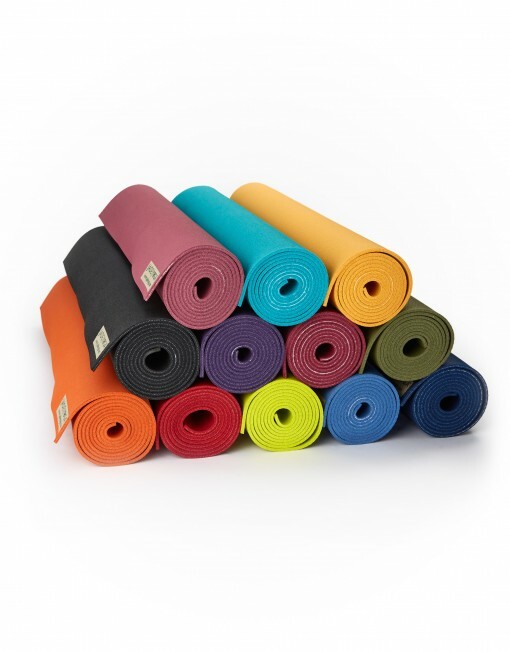 The selection of colours and sizes of Jade Yoga mats is incredible. There are 5 different styles of mats and more than a dozen different colours to choose from. 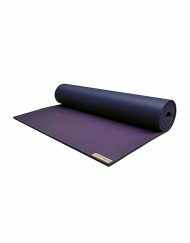 They offer mats perfect for travel or pilates as well. Jade Yoga also sells yoga towels, blocks, bags and accessories. They support wonderful causes as well. Buy a yoga mat – they plant a tree, buy a towel – they provide fresh water, buy a block – they preserve a rainforest. Jade mats are made with natural rubber and contain no PVC or other synthetic rubbers. Natural rubber is tapped, like maple syrup, from a rubber tree, a sustainable, renewable resource. We use natural rubber because it grips better and has more cushion than any of the synthetic rubbers on the market. All mats are made in the USA. 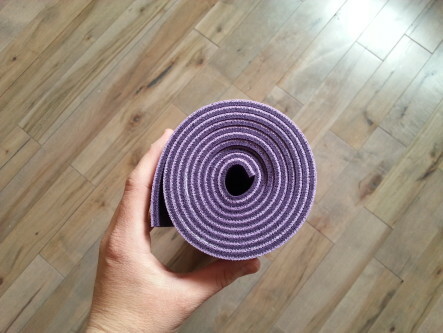 For my Jade Yoga Harmony Professional Mat review, I chose the lavender/purple mat. It is gorgeous! I couldn’t wait to get my yoga on! When you first open the mat it has a strong rubber scent but that dissipates within a couple of weeks. I love how cushy the mat feels, there is no pain in my knees with this mat. I love this yoga mat! My favourite thing about the mat is how grippy it is. The open cell rubber is not slippery at all even when wet with perspiration. The entire mat is made with this rubber so the mat doesn’t slide on the floor and you don’t slide on the mat. I can plant my feet and hands and not worry that I am going to slip onto my face. This has allowed me to be more adventurous and brave while trying out the more difficult yoga poses, greatly growing my practice. I had been using a mat I bought for cheap at a big box store, I slipped and slided on that thing constantly! So annoying. Nothing ruins your zen more than being annoyed while trying to do yoga. Not to mention, chunks came out of my mat just from regular use. As my father always says, you get what you pay for. I would never be able to go back to using a cheap mat again. 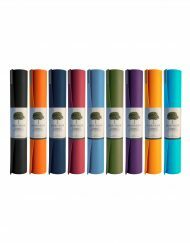 I love that Jade Yoga mats are made of a renewable resource, contain no PVCs and are made in the USA. 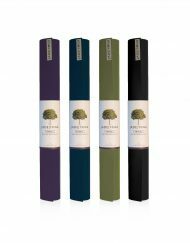 You know that when you purchase a Jade Yoga mat you are supporting the North American economy and helping the environment all while getting a quality made product that will last you for years to come. 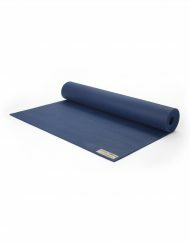 The Jade Yoga Harmony Professional Mat costs $77.50 to $84.95 depending on the size. After using the mat for some time now, I can say it is definitely worth the money. You can tell it is a very high quality mat and like any sport if you invest in proper equipment your experience will be much better. 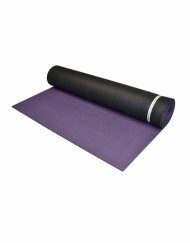 JadeYogaMats.ca has generously offered to give away a Harmony Professional yoga mat of your colour choice in size 24″ by 68″. Open to Canada only as JadeYogaMats.ca is the Canadian distributor for Jade Yoga.